Start the day close to Dublin's Ballsbridge neighborhood. Choose to have breakfast and a coffee at either Angelina's Deli just off of Baggot St., iconic 3fe, or family-run Annie's. Angelina's is more of a grab and go place where you can pick up something savory or sweet to takeaway with your coffee. 3fe is good if you'd like to sit down and enjoy a single-origin pour over with some porridge or a croissant. Annie's is cozy and also good for sitting down for breakfast. Enjoy eggs on toast or a scone with your coffee. 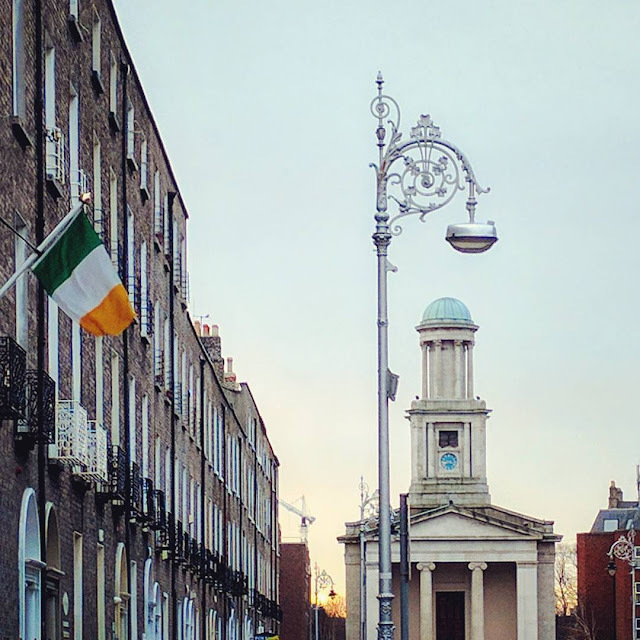 From here, walk Dublin's Grand Canal to St. Stephen's Church which looks stunning in the morning light and is a great little-known Dublin photo-op. St. Stephen's is commonly known as the Pepper Canister because its elegant tower resembles a pepper grinder. Walk down picturesque Mount Street Upper past a row of Georgian buildings now filled with offices each marked by a wrought-iron railing and colorful doors. Walk through Merrion Square Park which is filled with well-coiffed flower beds. Look for a sculpture called The Joker which was erected in memory of Dermot Morgan, the Irish actor who played Father Ted in the irreverent hit TV comedy. 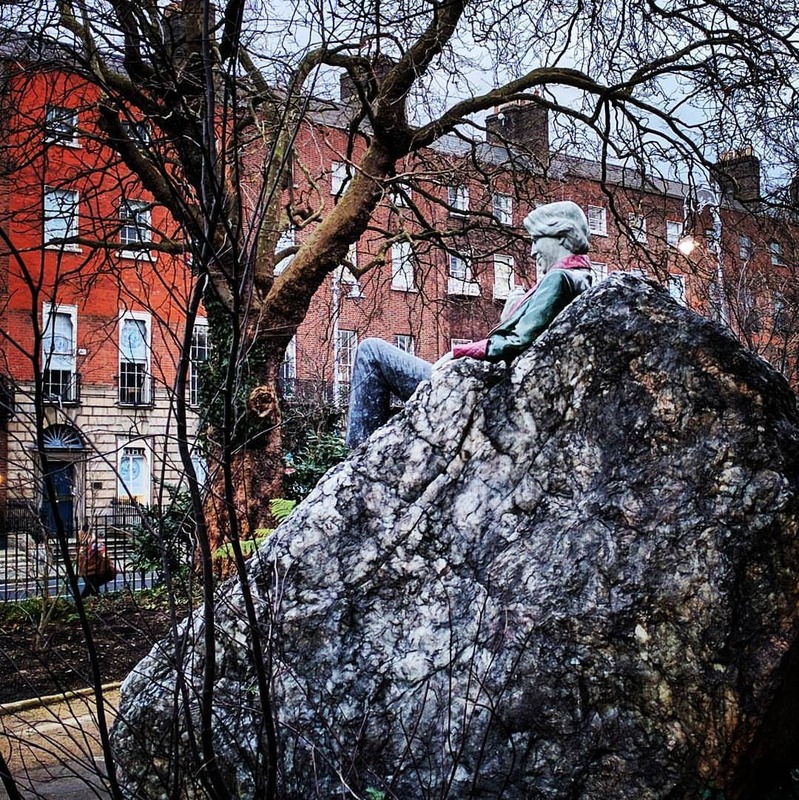 You'll also find an iconic statue of Oscar Wilde lounging jauntily in the corner of Merrion Square Park. The statue is carved from a single piece of marble and is quite impressive. Merrion Square is also one of my favorite parks for bird watching and for photography. On Sunday, the Merrion Square Open Art Gallery takes over and paintings from local artists hang from the fence surrounding the park. On Thursdays you'll find a lunchtime food market in Merrion Square offering all sorts of tasty cuisine from around the world. 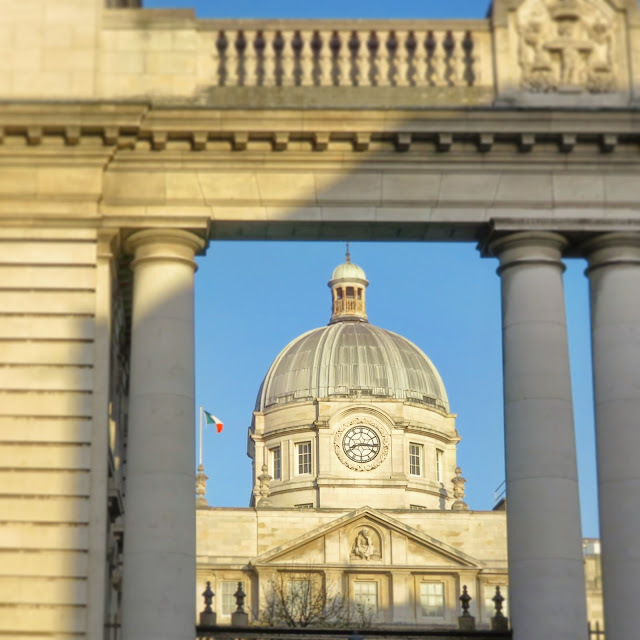 You'll find Ireland's answer to the White House across the street from Merrion Square: the Government Buildings. Just like in the U.S., the Government Buildings complex is home to the head of government, but instead of a president, you'll find the Department of the Taoiseach (the Taoiseach is in essence the prime minister for the Republic of Ireland). You'll notice one major difference between Ireland's Government Buildings and those in the U.S. In Ireland, you can walk right up to the gate and peer in with barely a security guard in sight. In fact, once on a walk several years ago, I walked right by former Taoiseach Enda Kenny on the street next to Merrion Square. The National Gallery of Ireland and The Museum of Natural History are adjacent to the Government Buildings and both are free and open to the public. The National Gallery of Ireland sits in a gorgeous white brick building and features some lovely works by Irish artists grouped by era. There is a particularly stunning exhibit of paintings by J.B. Yeats (W.B. Yeats' brother). That was a seriously talented family! The Museum of Natural History (Dublin's infamous 'Dead Zoo') features two stories filled with taxidermy on display in Victorian-era wooden cases. Insects that Darwin amassed on the voyage of The Beagle are part of the museum's collection but they are rarely on display. In my opinion, the 'Dead Zoo' is a must-see for visitors to Dublin. Walk around the block to Kildare Street where you'll see Leinster House, home of the Irish National Parliament (The Oireachtas). On one side of Leinster House, you'll find the National Museum of Ireland - Archeology. Getting a glimpse inside this historic building is reason enough to visit the museum. Stay and discover Bronze Age, Viking-era and Medieval artifacts. 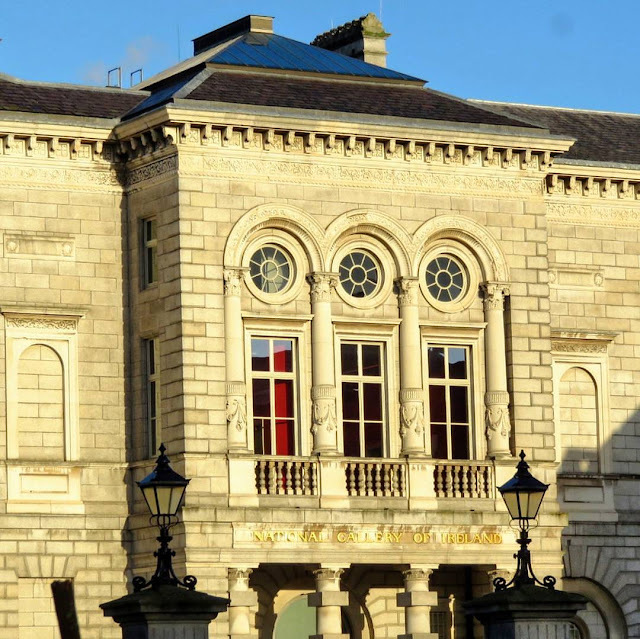 On the other side of Leinster House, stop into the National Library of Ireland which features a grand picturesque reading room with a soaring dome and exhibitions drawn from their extensive collections. Both the National Museum of Ireland - Archeology and the National Museum of Ireland are free to visit. 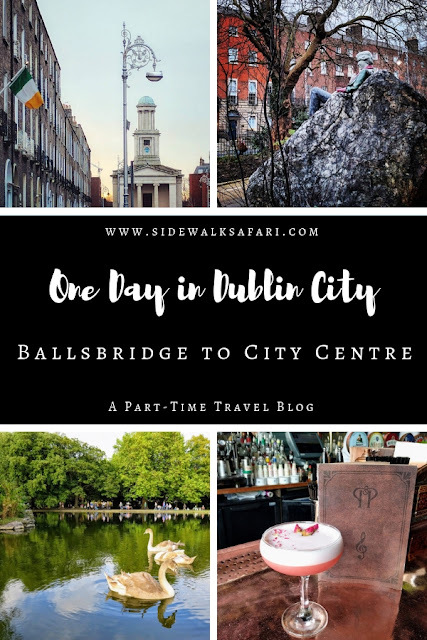 For lunch, wander further into Dublin City Centre. Consider eating at Kilkenny, Metro Cafe, or Bewley's. Kilkenny serves up food cafeteria-style. Enjoy quiche with a selection of side salads. On Sundays, you can catch Jazz or Bluegrass music played live from late morning through late afternoon. Kilkenny Cafe is located on the upper floor of Kilkenny shop. After lunch, you can have a browse for Irish-made crafts of high quality to bring home. Metro Cafe is best on a nice day when you can sit outside and enjoy soup, a sandwich and even a glass of wine. Bewley's Cafe was recently renovated and sits in a historic building on Grafton Street. Bewley's is your top choice if you have a sweet tooth. Stephen's Green is Dublin's iconic city park. After lunch, go for a stroll through the park admiring the flower beds and watching resident birds splash about in the pond. Stephen's Green is where all of Dublin goes to get some sun on a fine day. If Stephen's Green is too crowded for your liking, make your way to Iveagh Gardens. Tucked away behind the facades of Harcourt Street, Iveagh Gardens is a quiet respite from the hustle and bustle of Dublin City Centre and boasts some elegant statues and water features. Taste of Dublin is hosted in Iveagh Gardens each Summer in mid-June. Time for a pint! Head to Alfie Byrne's, a Galway Bay pub if you are looking for Irish craft beer. The Duke is great for a quiet pint of Guinness and The Hairy Lemon is a busier spot with lots of items of flair on the wood paneled walls. You can't go wrong with any of these choices for a pre-dinner drink or two. For dinner, consider The Farm for fresh, vegetarian-friendly choices made from local ingredients. Marco Pierre White is a good bet if you are interested in a well-prepared steak with French-inspired sides in a stylish setting. Another upscale option is Peploe's right on St. Stephen's Green where you'll find famous figures like Bill Clinton and Nelson Mandela pictured on the walls. Dishes include things like a goats cheese 'crotin' and handcut gnocchi with shrimp and chorizo, marrow crusted pork chop and a rump of Irish beef. For dessert, you might order a rhubarb crumble or an exquisite flourless chocolate fondant. 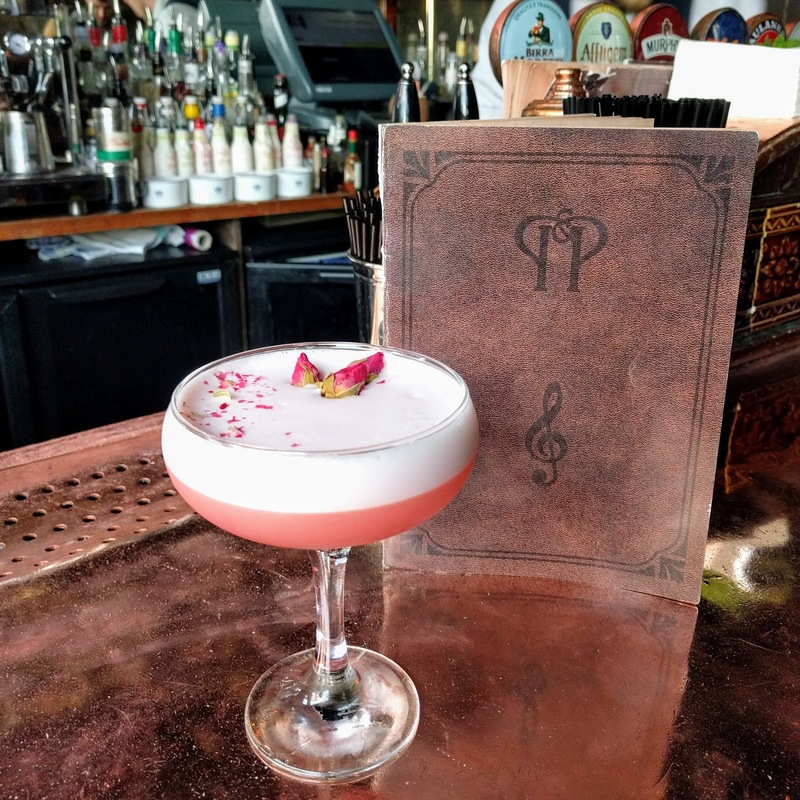 For the evening, catch a refined musical performance at the National Concert Hall, a play at the Gaiety, or just go and grab a cocktail prepared with tremendous attention to detail by a hipster bartender at Peruke and Periwig. Learn about a one day Dublin City itinerary focused on non-touristy places in Ballsbridge. 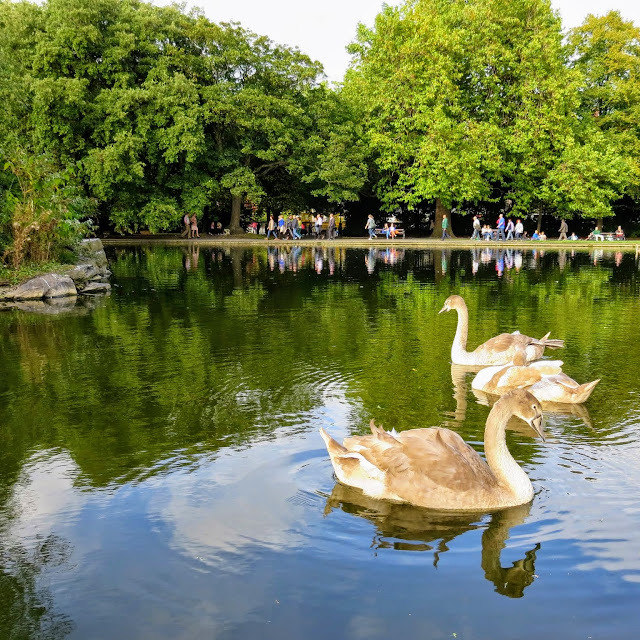 Move on to Dublin City Centre and explore museums like The National Gallery of Ireland and the Dead Zoo and then check out Dublin's Georgian parks like Stephen's Green and Merrion Square.